Some films (Palki, Deedar-e-Yaar) seek to buy classic status with massive budgets and crumple under the pressure of their own pageantry. Pakeezah is lavish in its treatment of a courtesan's turbulent story, but its splendour fills the eye, stirs the senses. And it ultimately showcases the heart beating at the film's core. Pakeezah's chandelier-heavy, fountain-adorned Gulabi Mahal is draped with flimsy curtains and inhabited by statuesque women with trailing dupattas. There is nothing stark here. Amrohi narrates a story imbued with the despair and the euphoria of human desires so deftly that you are caught up in the swirl of the visual maximalism in the fanciful, almost surreal setting. And by the romanticism of the wish-fulfillment end. It helps that the stage is occupied by Meena Kumari. That she was a great tragedienne enhances the impact of her performance as a woman grappling with the dualities of her life. And that voice, even when not uttering a sparkling gem, has a lyrical quality that resounds through the film. Meena Kumari has a double role in the film. As the blonde-haired Nargis, she seeks to escape her kotha [brothel] by eloping with her lover Shahabuddin (Ashok Kumar). The patriarch of Shahabuddin's family refuses to accept her and Nargis flees to a graveyard. On her deathbed, she writes him a letter asking him to come for his newborn daughter. Her sister (Veena) arrives first, finds her dead and takes away the daughter back to the kotha. There's something wistful about the way Shahabuddin eventually gets the letter. Nargis' belongings have been sold and several years later, a book lover finds her letter in her book. Shahabuddin comes to collect his now adult daughter, Sahibjaan (Meena Kumari again). But Sahibjaan's furious aunt, takes her niece and flees by train. On the train journey, a dashing young man (Raaj Kumar) enters the sleeping Sahibjaan's plush compartment and, enchanted by her feet, leaves behind a note : Aap ke paon dekhe, bahut haseen hai. Inhe zameen par mat utariyega -- maile ho jayenge [I saw your feet, they are very beautiful. Don't place them on the ground, as they will get dirty]. Ironically, as a courtesan, Sahibjaan has to put the same feet on the floor and figuratively dirty them by dancing the mujra to entice men. The note gives Sahibjaan hope even as she avoids unwelcome attention from her patrons. Amrohi effectively uses two sound motifs throughout the film --- the train's piercing whistle, which reminds Sahibjaan of her admirer and hope; and a soulful alaap by Lata Mangeshkar which mirrors her moments of sadness. Sahibjaan does meet the stranger (his name is Salim), but feigns amnesia to avoid telling him her reality. She is brought back to the kotha, runs away and, coincidentally, bumps into Salim again. Salim turns out to be Shahabuddin's nephew. Salim takes her home but the feisty patriarch will have none of it. Sahibjaan seems fated to relive her mother's sad story. But Salim defiantly leaves home with her and when Sahibjaan confesses she is a tawaif (prostitute), steadfastly stands by her side. At their marriage, he refers to her as Pakeezah (the pure one). Worried about her reputation on Salim, Sahibjaan takes to her heels again. Her destiny, she is convinced, is bound to the kotha, the tomb embalming her zinda laash [living corpse]. A hurt Salim invites her to do a mujra at his wedding. In a frenzy, she dances on broken glass --- scarring the feet he loved so much --- symbolically seeking to destroy their love. Finally, Shahabuddin learns that she is his daughter. Salim's doli [palanquin] defies all convention and arrives at Sahibjaan's kotha --- thus a happy, emotion-charged ending. Pakeezah's simple plot is laced with too many coincidences. There's also a heavy reliance on symbolism. The bird with clipped wings and the snake in the kotha serve as external symbols of the struggles in Meena Kumari's life. At times, the semiotics is heavily underlined --- a torn kite on a tree is shown when Meena returns to the kotha. There is a dialogue comparing her to it as well. Amrohi proves himself a master at creating a mood. He enlists the help of erstwhile Bombay Talkies cameramen, German Wirsching and R D Mathur. With a meticulous eye for detail, Amrohi composes a series of elquent tableaux. Amrohi's literary approach helps. The dialogue is terrific. When the family patriarch tells Raaj Kumar, "Doodh ka jala hua chhas bhi phook phook ke peeta hai [after burning your tounge with hot milk, you will drink buttermilk after blowing into it]," Raaj retorts, "Afsos, log doodh se bhi jal jaate hai [Alas, people get burnt of milk too]." Raaj Kumar makes his presence felt through the likeable steadfastness of his character as well as through his own screen presence. 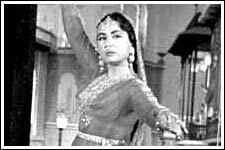 Meena Kumari's failing health necessitated that some of the dance sequences and scenes be shot without her. Amrohi shot the entire song Chalo dildaar chalo without showing her face. Her understated performance and moist eyes sparkling with unshed tears have a hypnotic effect. Meena Kumari died within two months of the film's release. She couldn't have asked for a more befitting swansong. * Pakeezah was directed by Meena Kumari's husband Kamal Amrohi. She had worked under his direction earlier in Daeera (1953). In all, he directed four films (Mahal and Razia Sultan are the other two). * Kamal Amrohi performed the mahurat of the film in Ferbruary 1956. It is said that he planned to star in it then. The film was stuck in 1964 when Meena and Kamal separated. A few years later, well-wishers like Sunil Dutt and Nargis advised them to restart the film. * The film was released February 4, 1972. At the premiere, Meena Kumari sat between Raaj Kumar and Kamal Amrohi and was very pleased with the film. When Khayyam complimented her with Shahkar ban gaya [the film has become priceless], she was in tears. * Like Meena Kumari, Ghulam Mohammed also couldn't enjoy the fruits of Pakeezah's success due to an untimely death. The composer hadn't really achieved frontline success despite crafting some exquisite melodies for Suraiya in Mirza Ghalib, Maalik and Shama. However, Pakeezah's perennially popular score gave him lasting fame. * Naushad composed the theme music and is said to have significantly contributed overall after Ghulam's death. His alaap for Lata is exquisite.